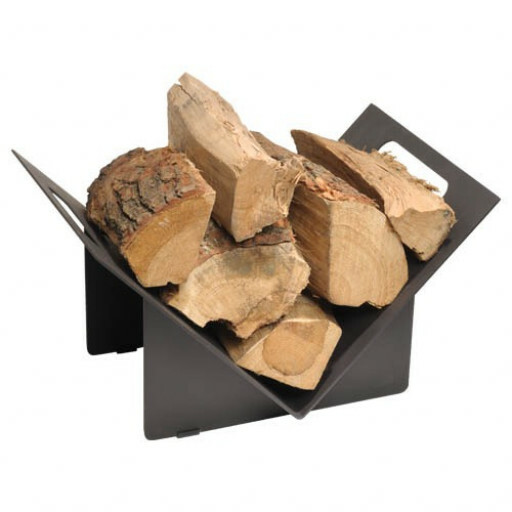 Fireplace Warehouse offers this simple yet stylish log rack for your consideration. The Stovax 3401 Triangular Log Rack is a handsome charcoal black, designed to work perfectly with any colour scheme and any décor in your home. Such free standing log holders are the ideal companion for your fireplace. The compact design allows you to keep a small amount of split wood handy for starting or refuelling your fire. The design of the Stovax 3401 Triangular Log Rack has an angled tray made of steel which sits on two steel supports to raise it up from the floor. The angled shape ensures that the pieces of wood naturally accumulate toward the centre of the rack and are therefore less likely to slide off the rack. Two handles, one on each end of the rack, allow you to move and place it easily. The dimensions of this compact log rack are: 424 mm wide, 242 mm high and 300 mm deep. Stovak was established in 1981 with the purpose of designing and manufacturing high quality fireplaces, stoves and accessories for distribution across the United Kingdom and Ireland. From the start, Stovak has chosen to use only the most premier materials in the construction of its products. Fits neatly next to my stove.